It takes Rob McDonald roughly an hour to get from his home in Brookline, near the western edge of the BU campus, to his office in Kendall Square. I first heard about McDonald's unorthodox ride from Pete Bell and Steve Papa, the two founders of Endeca, a Cambridge company that develops software for e-commerce and business analysis. (They also mentioned that when Governor Deval Patrick visited the company earlier this year, he chatted with McDonald about it, somewhat incredulously.) When I e-mailed McDonald, he told me that he considers it "the best commute of anyone who works within 495." So I decided to tag along one day earlier this month. We met at a doorless brick garage in Brookline at 7 a.m. McDonald was in shorts and a life jacket, and he was extracting the kayak from its spot next to a non-working car. McDonald stuffed his lunch and a polo shirt into a dry bag that went into the kayak's cargo compartment. 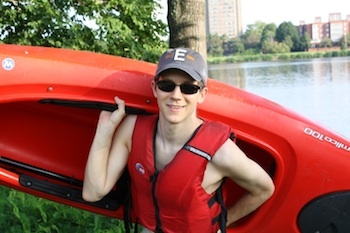 He hefted the 42-pound kayak onto one shoulder, and we set off for the Charles River. (When I picked up the kayak later, I estimated that I could perhaps carry it half a block.) "I wasn't in bad shape before," McDonald told me as we walked, "but I wanted something that would help me get in better shape, while also getting me to work." In the fall and winter, the watercraft is replaced by a pair of Rollerblades. He stoops to walking (or riding the T) only on very rainy days, or when there's snow or ice. "I want to walk as few days as possible," he says. Part of the route took us along Commonwealth Avenue, with Green Line trolleys zipping past and the traffic of the Mass Pike thrumming beneath us. McDonald explained that the bridge he normally used to get to the Esplanade, near BU Beach, was still being repaired, so he was forced to take a bridge another two blocks to the east. McDonald said that after he moved to Brookline in July 2009, he started wondering about the possibility of kayaking to work, noting that both his home and office were near the Charles. He bought the kayak last year, and inquired about whether he might be able to keep it in his office building's indoor bike storage room. The answer was no. So he rents a parking space from Charles River Canoe & Kayak, which operates a small rental marina in the Broad Canal, just behind Endeca's Kendall Square building. The monthly rate? $150. No one remarked on McDonald's transit through the BU campus with a kayak on his shoulder, but he told me he did occasionally get comments. 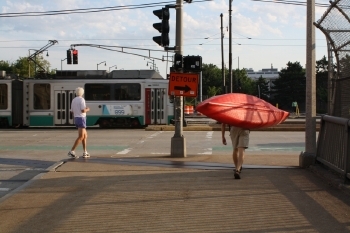 "A couple of people walk along and want to have some meaningful discussion about the kayak. A cop who directs traffic sometimes says, 'Do you have a license for that?' Sometimes people ask me if I need help with it. Fewer comments than I would expect." When the students return to BU's campus in late August, he said, the walking part of his commute "gets much more difficult, because there are so many of them on the sidewalks. You have to be careful not to bash them in the head when you make turns." 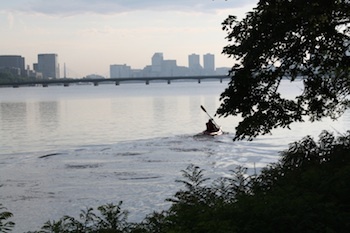 After we'd crossed Storrow Drive on a pedestrian bridge, McDonald put the kayak on the grass near the river's edge. He took a plastic case that contained his mobile phone and strapped it to his leg. "The second day I started kayaking, I got caught in a downpour and lightning storm, and had to wait it out under a bridge for maybe 20 minutes," he told me. "After that, my wife insisted that I get a phone." (He typically uses it to listen to novels as he paddles to work.) As he got ready to get into the boat, he also mentioned that he was once hit by a rower: McDonald was facing forward, and the rower backward. Neither was injured, and McDonald's kayak wasn't damaged. "I haven't flipped," he said, "and I haven't hit anyone else. I have seen dead ducks and dead fish — all kinds of weirdness out there. But I missed both the seal and the alligator that were in the Charles." McDonald slid the kayak through some weedy growth at the water's edge, and hopped in. By my watch, it took about 28 minutes to get from his condo to the river, although we did talk for a few minutes on the Esplanade before he set off at 7:33 AM. As McDonald paddled off toward the Massachusetts Avenue bridge, I got on my bike and rode toward Kendall Square. At 7:58, I got an e-mail from McDonald: he was pulling into the canal behind his building, and where was I? (Thinking he'd take a little bit longer, I'd ducked into Dunkin' Donuts for an iced coffee.) McDonald pulled the kayak out of the water at Charles River Canoe & Kayak's floating dock, and walked it up toward a rack that sits in the shadow of the Genzyme building. McDonald removed the dry bag, put on a polo shirt, and then he locked the kayak to the rack. He walked around the corner to 101 Main Street. Once inside, he'd use one of the two showers in the office, and be at his desk before 8:30. The commute is roughly three miles each way: just about a mile on foot, and two on the water. Google Maps estimates that you could do it in about 52 minutes on foot, 42 minutes on public transit, and 18 minutes on a bike. But Rob McDonald would rather be on the water.